After nearly 1 year in development, Advanced Poker Training is proud to announce the new Reports and Training Plan features, which will allow you a closer examination of your poker skills than has ever been possible. 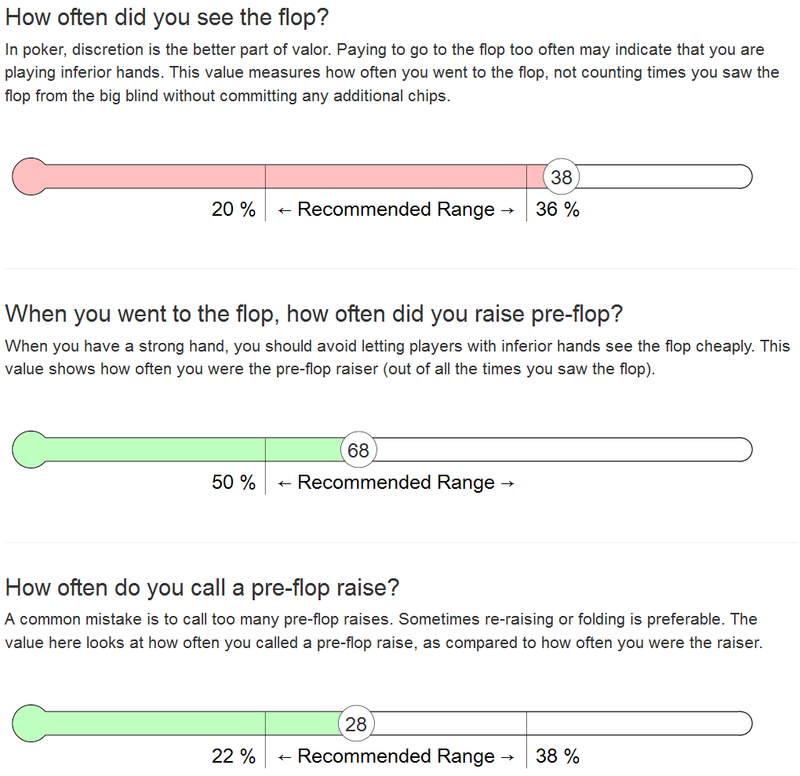 Instead of viewing the screenshots below, you might prefer to try out our Interactive Sample Report and Sample Training Plan. Are you ready to take your poker game to the next level? Then Start Training Now! Your training plan is updated once a week. Our analyzer looks at data from all the pages of your reports, examines recent trends, and recommends where you should be focusing your training efforts. Two examples are shown here, but there are dozens more. The number of stars indicates how important it is to address that problem. In this case, the player is being advised to practice more with Ace-Queen, due to their overall win rate being too low. The "Practice Now" button immediately deals 50 hands of Ace-Queen in the APT poker game. 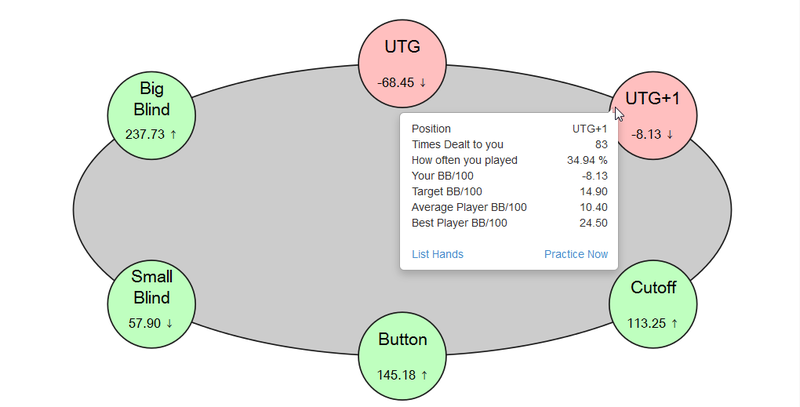 Our analyzer is advising this player that they had an inferior hand too often when going to the turn. When you first open your report, you'll see the overview page, which lets you take a high-level look at how much you've been winning. 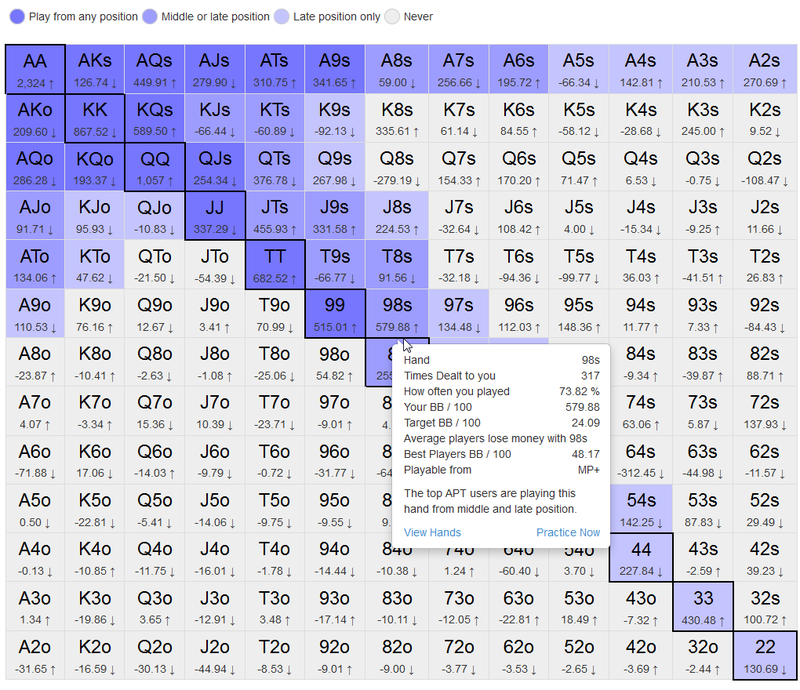 The overview grid shows the number of hands you've played, your winnings, and your RealPokerIQ™ score, for various date ranges. You can always select a custom date range. Trend arrows show if these figures have recently been going up or down. 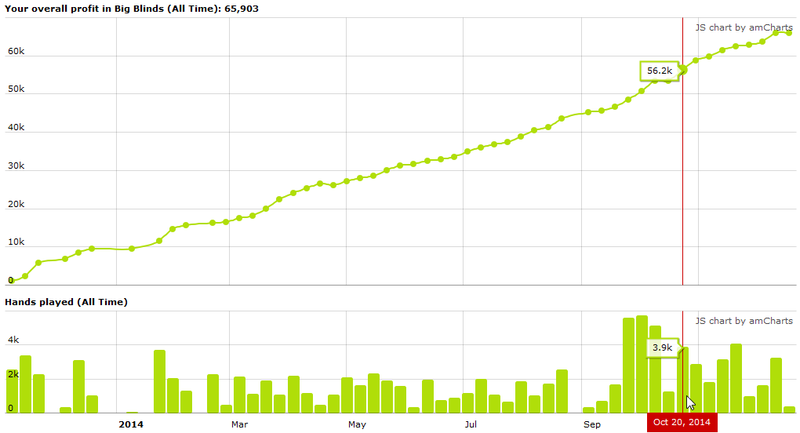 Here you can look at your winnings in graphical form, either for all time, or a custom date range. Also shown is the volume of hands played for each week. The performance pages let you view your actual win rates - looking at them by starting hand type, by position at the table, by difficulty level, and even by street. 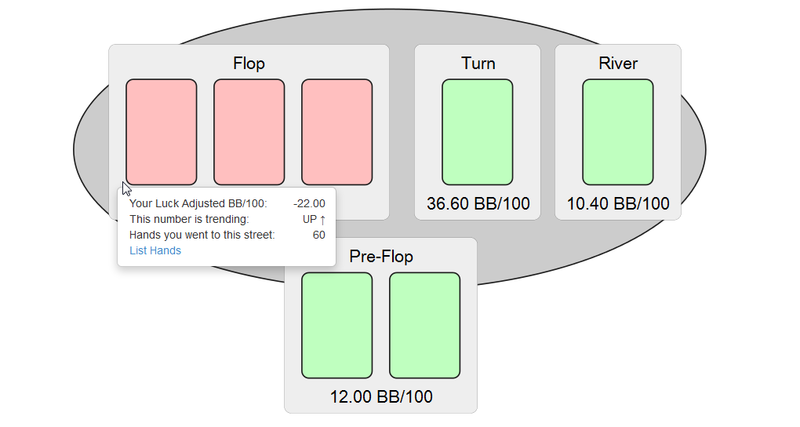 Of course, as with every page, your results are separated by game type (9-max, 6-max, Multi-Table Tournaments, etc). And, with a few clicks, you can view these for whatever date range you like. The Hand Chart page shows which hands are playable, from which positions, for each game type. It also shows your current win rate and trends. Alternate views (not shown here) display those hands that are causing you the most difficulty. The Positions page looks at your win rate from each position at the table, and compares it to the win rates of the average player and the best players on APT. The page shown here is for 6-max. You can track your performance at each difficulty level. In the example shown below, this APT member seems to be having trouble at the "Dumpster Alley" difficulty level, and would be advised to practice more against those opponents. Even your performance on each street is analyzed. This uses our scientific "Luck-Adjusted" calculation that evaluates your true performance, eliminating the effect of luck. The skills page looks at nearly 15 different metrics. It graphically shows you how your statistics are matching up with those recommended by the top pros, and the choices made by the highest winning players on APT. A few of these are shown below. The luck page looks at how lucky you've been recently, from 10 different angles. This can help you determine if some recent losses are simply the result of bad cards. Some examples are shown below. 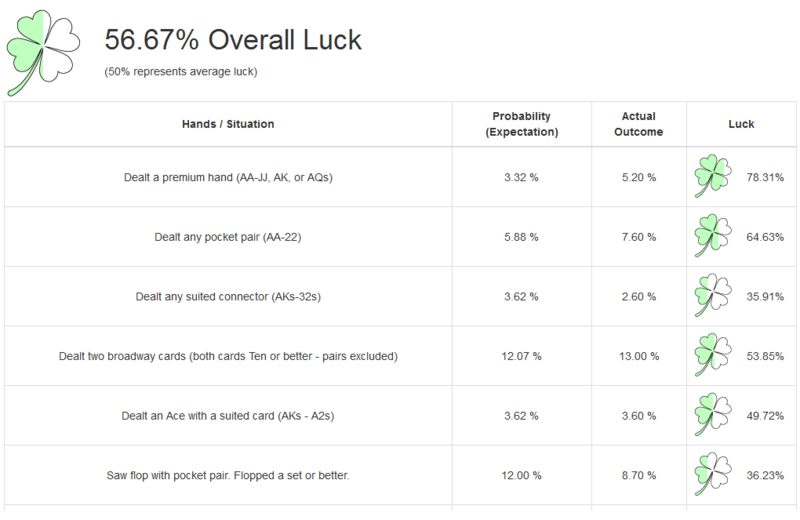 The Hand Analysis page provides a quick look at some critical hands you’ve played lately, in several different categories. Two of these categories are shown below. This grid shows the hands on which you won the most. The Replay button allows for an instant replay in a pop-up window. These hands were automatically marked, or "tagged" by our software, indicating our analyzer disagreed with your decision. They come in two flavors: "Questionable" decisions and "Interesting" decisions. You can review the hand and draw your own conclusions, or share it with friends. After nearly 8 years of non-stop feature development, there has never been a website that offers so much. It's no wonder AdvancedPokerTraining.com is the #1 poker training website. So, what are you waiting for? Start Training Now, and get ready to ignite your game!